Happy May and you know what May means: Met Gala season! The Met Gala takes place every first Monday in May and is my favorite day to judge celebs on their crazy amazing outfits, how on theme they are, and that one or two people that fall while walking up the steps (it happens every year and the pics are always hilarious). Each year there is a theme that designers/celebs are supposed to follow and this year's somewhat controversial theme was "Heavenly Bodies: Fashion and the Catholic Imagination." I am in no way a fashion critic or know pretty much anything about fashion, but I like to pretend I do, so here we go. Here are my top ten best looks at this years Met Gala! 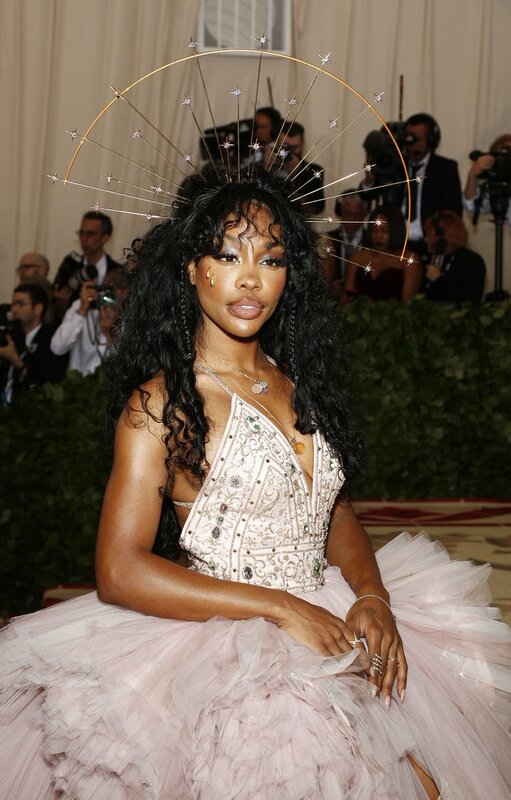 I loved SZA's Met Gala debut and thought she was spot on with the theme. The blush looked beautiful on her and I thought it was just an overall spot on look. She walked for Versace and I thought the gold headpiece from the jewelry designer CHRISHABANA brought the look together so elegantly. 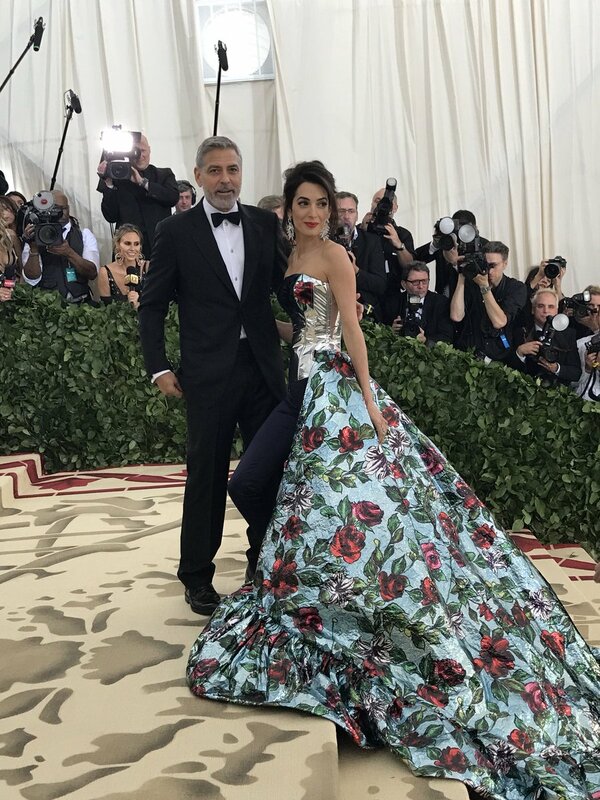 SJP and Andy Cohen are seasoned vets at the Met Gala and of course Sarah Jessica Parker has to show up looking 110%. 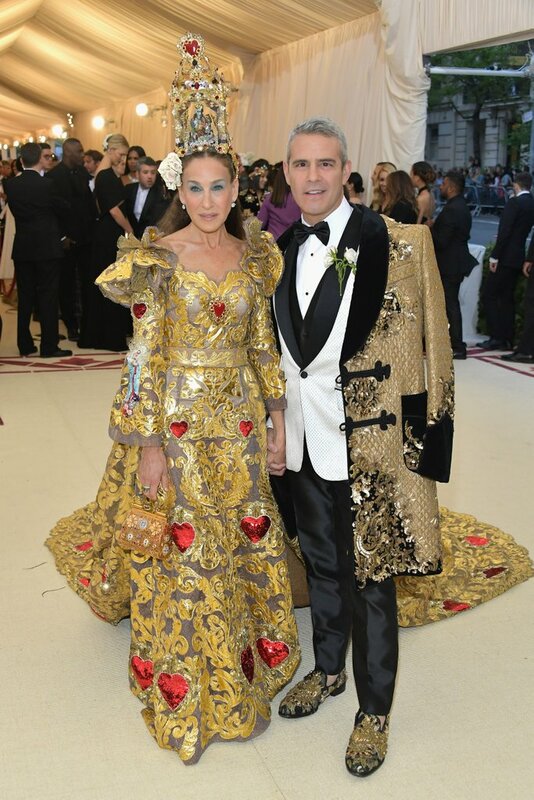 SJP was dressed as 15th-century Venetian queen and looked so amazing, I honestly don't know who else can pull off some looks like she can. They both walked for Dolce & Gabbana and definitely showed the newbies that barely follow the theme how its done. Donald Glover can honestly do no wrong in my eyes and I probably would have put him on this list if he showed up wearing a trash bag (lol but honestly). He looked great in a brown suit and can I say I love the Gucci loafers! Unlike most of the other outfits, he took a bit of a different approach of the theme into the conspiracy side with the "eye of Providence" encrusted in diamonds (same image on a dollar bill). I thought this was super interesting and loved how the rest of the suit is minimalistic and it just loved the entire outfit. Okay so Shawn and Hailey were 100% going to be on the list, are you surprised? And yes I'm counting them as one as well because I think the fact that they went together and wearing the same designer makes them look even better and they're freaking adorable together. They both walked the carpet for Tommy Hilfiger and although they weren't super on trend with the theme, they both looked amazing and amazing together!! So okay, apparently they aren't dating, but they sure do make a cute couple if they ever do decide to date, I mean look at how great they look together! 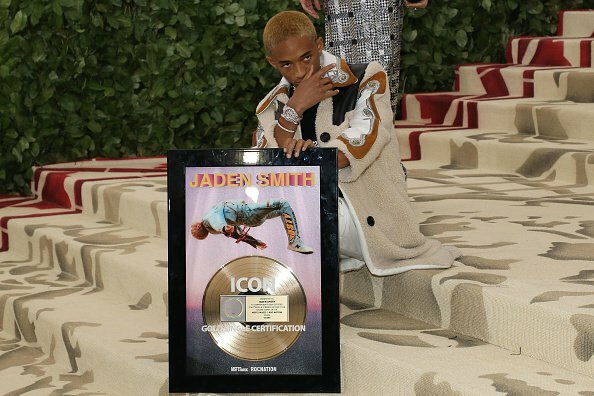 Jaden Smith brought his GOLD CERTIFICATION of his single Icon. If that's not something an icon does, I don't know what is (plus the song is a jam and a half-- check it out if you haven't already) What a legend, especially after bringing his hair last year I didn't think he could bring anything better (other than his bff JB obvi) but I loved it, he knows how to create a buzz for sure. His outfit was good, I honestly expected better from him, but I couldn't not put him on the list with his gold certification as his date. For the guys, Chadwick Boseman in Versace was best dressed of the night for me. 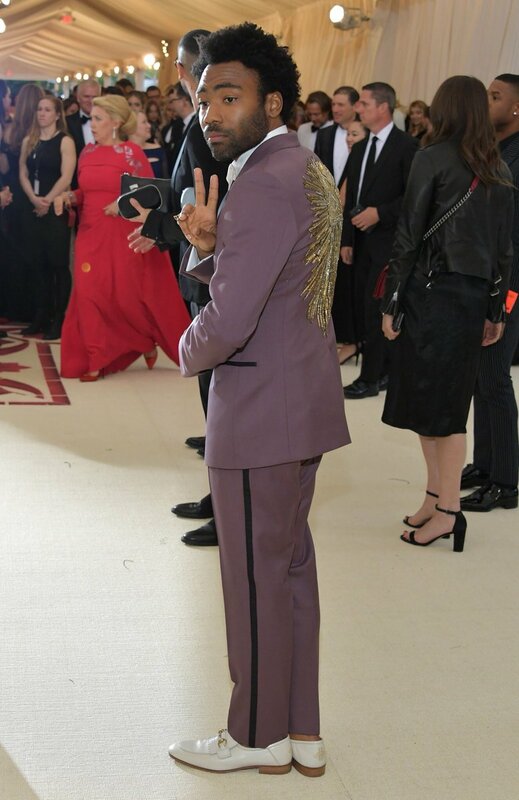 Coming off of the Black Panther buzz, everyone was excited to see if he was going to attend the Met and he definitely delivered. 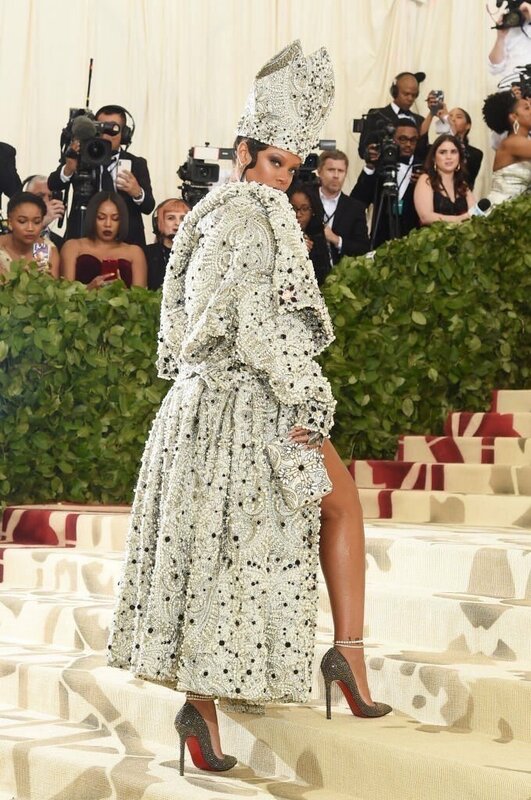 Rihanna always wows at the Met Gala and she is definitely one of, if not the most, anticipated people to see each year and she snatched all the wigs this year coming dressed as a POPE. The look was designed by Margiela and the Louboutins pull it together so nicely. OBSESSED. The queen of Met Gala. Don't fight me on this. No one can do Met Gala better than Blake Lively and this year was just one example of her slaying the red carpet. She also wore Versace, and her dress apparently took over 600 hours to complete. Blake looked amazing head to toe and I heard the Lorraine Schwartz jewelry she wore was worth $2 million--holy s***! You guessed it, Ariana Grande. Maybe it's cause I love her to death but she's my #1 for this year's best dressed list and am wicked obsessed with her entire outfit. Her dress was amazing and can you believe it was her first time at the Met Gala! Ari walked for Vera Wang in a dress inspired by Michelangelo’s “The Last Judgement,” a painting inside the Sistine Chapel and looked amazing. And, of course, a few honorable mentions!